in ruins; The present Abbey church founded in 1499, ruined after the dissolution of the monasteries in 1539 by order of Henry VIII. generations of those whose church it has been and by other benefactors. 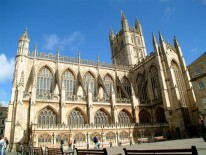 The Bath Abbey 2000 campaign of restoration and conservation has continued that tradition. Bath Abbey is now an active parish church in the Church of England. In 1999 it celebrated its five hundredth anniversary. embroidery which visitors can enjoy viewing. The Abbey Shop stocks a large range of bibles, Christian books, guide books, postcards, greetings cards, CDs, icons, jewellery and gifts. All profits from the shop go towards the ministry and maintenance of the Abbey. A Tower Tour gives visitors to the Abbey a chance to look at the building from a very different perspective. There are 212 steps to the top of the Tower arranged in 2 spiral staircases. A Tower Tour is fully guided and lasts for 50 minutes taking in the bells, clock face and fan vaulting before reaching the top of the tower with a 360 degree view of the city. Children must be at least 5 years old and accompanied by a responsible adult.